In any medium, it’s an almost insurmountable challenge to produce a product that stands the test of time. The majority of bands fade into obscurity, movies are forgotten in the wake of the latest pretty face, and all but the most iconic artists and authors get lost in the shuffle of the staggering volume of options the information age has provided us. This is only amplified in the case of video games, where increases in design complexity and rate of technological advance are exponentially unfolding. With this perspective, the achievements of the Civilization series become acutely mind-boggling. Spanning nearly 20 years of digital iteration (and a decade in board game form prior to that), the IP that brought gamers the invention of the tech-tree has managed to not only survive, but evolve, entertain, educate, and perform in the marketplace. That’s pretty damned impressive for a game that’s basically about world history. 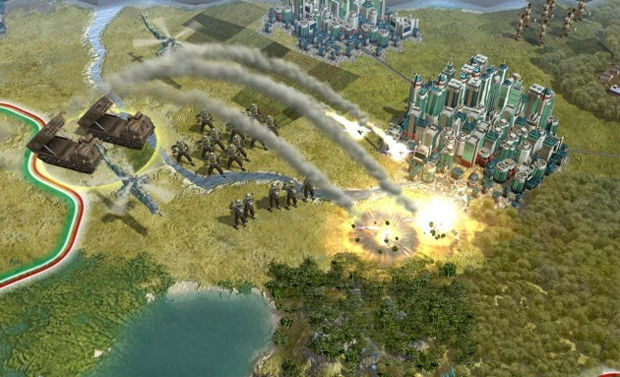 With Civilization V, the developers at Firaxis are rolling the dice yet again and making some sweeping alterations to the series’ DNA. Keeping a game with so much tradition fresh and fun without alienating a deeply loyal fanbase is a Herculean labor, to be sure. However, despite the barriers, Civ V manages to make an overwhelmingly strong case for investing in one more turn of “just one more turn”. 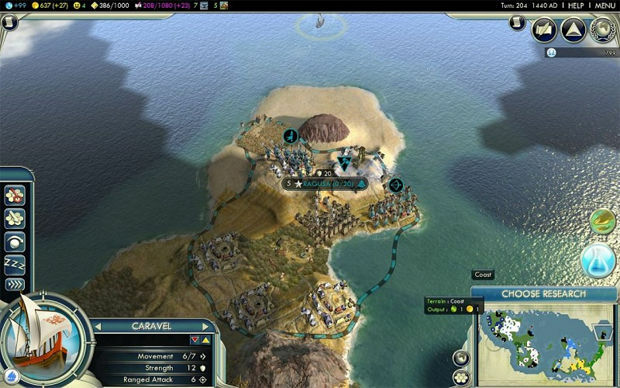 For those unfamiliar with the series, Civilization V is a PC turn-based strategy game that tasks the player with growing a single group of settlers in the Stone Age into a sprawling empire that outshines all others. Victory can be accomplished through a variety of means: military conquest, diplomatic maneuvering, cultural output, winning the space race through superior technology, or simply having the best overall score when the game ends in AD 2050. If this sounds incredibly complex and daunting, that’s because it is. There’s good news though -- Civ V does more to ease new players through the learning curve than any previous Civ game. Those that haven’t experienced the series before will likely find themselves eras deep in an engrossing strategy experience before they know it. As to the changes in Civ V from previous titles, we’ll tackle the cosmetic issues first. The most noticeable change to the presentation is the conversion from a square grid to a hexagonal one. The world takes on a much more organic appearance without having to rely on right angles to render curvy natural features like mountain ranges or coastlines. There are many more strategic implications to the hex grid as well, but we’ll come back to those a bit later. Graphically, the game looks fabulous; smooth unit animations and lots of detail in the unit and city designs make it a delight to zoom in on the map. Sound design is also strong -- each civilization has unique music that is both pleasing and unobtrusive. The loss of Leonard Nimoy as a narrator will bum some fans out, but Morgan Sheppard fills in admirably. He’s got an Ian McKellen-like quality to his voice that’s perfect for the tone of the game. 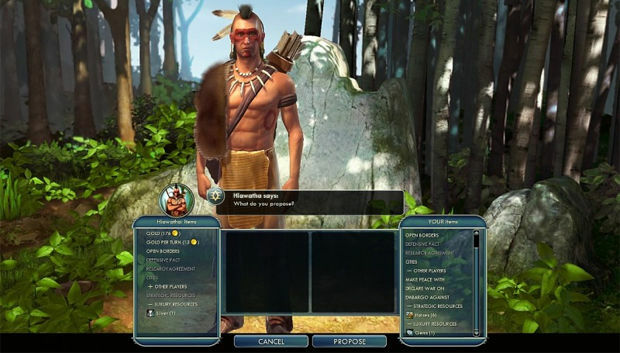 While Civilization Revolution was a divisive game for most Civ fans, it really can’t be argued that it did well in streamlining the user interface. 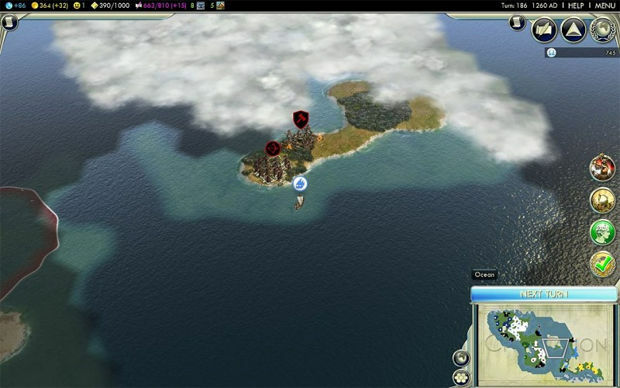 Civ V brought back the same UI talent, and their work is immediately obvious. Where previous games were a Byzantine labyrinth of menus, sub-menus, and advisor screens, nearly every major function in Civ V can be accessed without leaving the main map view. The only time I ever left it was for talking with leaders or to view the extended tech-tree on occasion to plan long-term research strategy. Where Civ V’s user interface really shines is the notification system. Any time an important event occurs or units and cities require your attention, an icon will drift down along the right side of the screen. Where in the past a tiny text description would appear and force you to hunt around the map to find what you need, simply left-clicking on the icon will center the map over the related object. The icons also act as a to-do list, which becomes doubly helpful in the later stages of the game when you’ll have much more to manage. I can’t overstate how much time and frustration this saves -- it lets you focus on planning rather than uninteresting minutia. Things like this are what help to make the full Civ experience more accessible to newer players. Diplomacy sees some subtle tweaks and upgrades; AI personalities for all the leaders are distinct and varied. They will have different approaches to their development, expansionist tendencies, and propensity for military aggression. These values will even shift slightly for the same leader from game to game, ensuring that you’ll always have a fresh puzzle to solve in how you plan your approach to every match. Trade is much more realistic this time around. Unless you’re greatly in or out of favor with another civ, you won’t find the other leaders to be unreasonably stingy or spineless pushovers -- all reasonable offers will be considered. It’s also smarter; when I offered an oil resource to a civ that didn’t have the technology to utilize it, they flatly refused my offer of mysterious black sludge even though it was vastly more valuable than what I was asking for in return. The introduction of city-states adds an extra layer of intrigue to Civ V. These standalone cities can be conquered or offer unique benefits like military units and culture if you befriend them. They will often request help if their safety is threatened by barbarians or other civs, which gives isolationist players (like myself) compelling reasons to get involved in world events. City-states also play into voting for diplomatic victories when the United Nations is built, so spending the time to interact with them is central to the game. On the research front, Civ V’s tech-tree is well balanced. Where many versions of Civ have allowed players to race to a key military tech like Gunpowder or Combustion and then steamroll the board, the prerequisites required to reach them in Civ V make focusing solely on those objectives a risky proposition. Some specializing can be beneficial, but a player who ignores the other branches of the tech-tree will find themselves deficient in production capacity, research or culture generation, gold output, etc., which will nullify their military edge in other ways. For a solo player who wants more of a challenge than the average comp stomp, this is a great thing. My one gripe with the tech-tree this time around is that even with all the research buffing structures built in all your cities, it can be difficult to reach the required techs to win the space race before 2050. In every match I’ve played so far, I’ve always reached the cultural victory conditions far before I could start building my spaceship. I tend to play smaller, focused empires (3-5 cities max), so this might be mitigated by pushing to expand your civ. However, that’s difficult if you play on a normal or small map size -- you’ll be forced to fight other civs early on to clear space for the needed cities to research faster. The government system of Civ IV is abandoned this time in favor of building a unique style for your empire through the adoption of social policies. Accumulating enough culture points will allow you to unlock different branches of policy and abilities within them; think of it as a sociological tech-tree. While certain branches can’t be activated simultaneously (ex. Piety and Rationalism can’t both be active), the benefits from each branch you have unlocked are cumulative. This is much less restrictive than the systems of previous games that force you to abandon all the buffs from one form of government in order to pursue another. Gone from Civ V is the religion system of the last game, and I’m happy to see it go. While it was interesting, it was also convoluted and drew too much focus away from other aspects of the game. You can still take over cities by surrounding them with your cultural influence, so there’s really nothing substantively lost by excising it. Also gone is the espionage element, which was an adequate sub-system, but I didn’t find myself missing it here. Civilization games have always excelled when played at the macro level -- managing the direction of your empire has always been interesting and fun. Where the blotches have always shown is at the micro level. Managing workers and land development has historically been a tedious and necessary evil to complete macro level goals. Additionally, combat has been less an issue of strategic usage of units and more a matter of outproducing your opponents or having superior military technology. Two major changes to the game take Civ V to a whole new level in terms of combat depth and enjoyment. The first (the adoption of the hex grid) does many things for combat. With movement reduced to six directions from eight, the number of choke points on the map increase, along with their strategic value. If you are facing a smart opponent who protects their strongest ranged attackers with footsoldiers, it’s tougher to get around and knock out siege units by flanking with your own footsoldiers. This makes mounted units like cavalry much more useful than in past games, as the additional movement capacity is vital for breaking an enemy formation from behind. The biggest and most welcome change to combat in Civ V, though, is that military units are no longer stackable. With one unit per hex, the days of racing to Combustion and then tanking up a stack of doom to just march across the map are over. This reduces the amount of overall units on the board, and makes each unit more valuable than ever before. This gives you incentive to plan your attack strategies and army make-up much more carefully. In Civ IV, individual units could earn experience to gain promotions, but it wasn’t impactful because a stack of units would always take down even the most experienced single unit. Now, unit promotions can give you the needed edge to win a battle, by allowing you to specialize for terrain or siege bonuses. This also increases the value of military structures like barracks that provide XP for your troops. Enhancing this is the adoption of hit points for military units. When two units clash, they both do damage to one another based on their strength values. Where in the past every fight resulted in one of the units being destroyed, this rarely happens in Civ V. Clashes take multiple rounds to resolve, allowing time for retreat or reinforcement. This creates much more strategic play, in addition to eliminating the often mocked “archer beats tank” anomaly from past games. The defensive side of the equation is also dramatically altered by the exclusion of stacking. Instead of garrisoning stacks of units in your cities, you are forced to meet your enemies in the field. Cities can also defend themselves; they have a strength and hit point rating based on their population that is buffed by building walls and other defensive structures. They can also bombard incoming attackers, making for a protracted siege-style warfare that is extremely enjoyable and deep. City and resource management sees some upgrades at the micro level, too. While advanced players will still want to manually select improvements for their workers to build, the worker AI in general is much more competent and is a viable option for lower difficulty levels or players who are working their way up the learning curve and focusing on other aspects. Roads now require gold to maintain, so the willy-nilly spaghetti network of roads from Civ IV is not a viable approach, and worker AIs are smart about only connecting cities to keep costs to a minimum. This also helps on the combat end by making it more difficult for enemies to approach your cities. Where territory gained from cultural output was doled out fairly symmetrically in the past, your cities will make smarter decisions as to which specific hexes to annex next. You can accelerate the process by using gold to purchase land sooner, but left to its own devices the city AI will give priority to nabbing hexes with revealed resources and your workers will give priority to developing them. 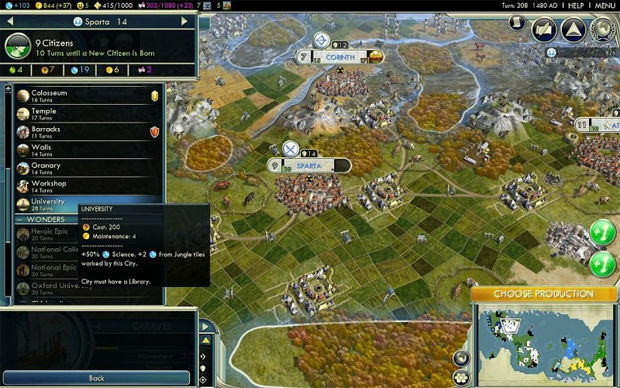 The multiplayer component plays out much as it did in Civ IV, with the simultaneous turn-based system helping to ensure that the action doesn't get too bogged down in waiting. With this system, whoever enters their commands first will get them executed first; while the core gameplay is still the same, players who are quick on the draw can eke out an advantage in certain combat and exploration scenarios. The connectivity varied in quality in the matches I played. However, switching hosts seemed to clear up any issues when they arose. Certain presentation frills were absent in some of the matches (like unit movement and combat animations), but this only served to speed up player turns and was not a drag on the enjoyment of playing. Up to 6 human players can be accommodated for any match, and turn timers can be set to keep slower players or griefers on point. 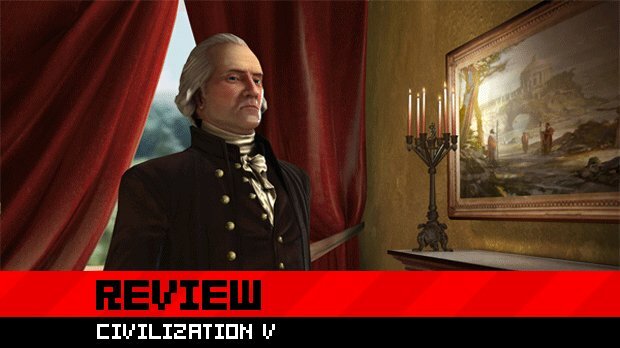 Civilization V makes huge advances to the series that do nothing but enhance the essential experience. Improvements to the user interface and AI at all levels result in it being more approachable for newcomers without losing any of the strategic depth that long-time fans crave. It vastly improves combat, making the micro-level gameplay both more complex and entertaining. It trims all the fat, leaving only decision-making, strategic planning, and the sheer joy of crushing your enemies. Civ V is the pinnacle of the franchise to date.